The 2017 Honda Civic Hatchback is in stock here at Brilliance Honda of Crystal Lake. If you’re looking for an efficient, stylish, sporty small car with premium features, then consider the EX trim level of the Civic Hatchback. Find out more about what makes this model special below. The Honda Civic Hatchback EX is equipped with a continuously variable transmission and a 1.5L turbocharged four-cylinder engine that makes 174 hp and 162 lb-ft of torque. The EPA estimates that the Civic Hatchback EX is capable of up to 31 mpg city/40 mpg highway in EPA estimates*. The Civic Hatchback in EX trim level gets premium features that are missing from the base model. They include a 7-inch touchscreen interface, a power retractable moonroof, and remote engine start. You also get other highlights including Bluetooth Connectivity, a rearview camera, automatic headlamps, LED daytime running lamps, an LCD color touchscreen, a USB audio interface, automatic climate control, and much more. Not only that, in testing by the National Highway Traffic Safety Administration, the Honda Civic Hatchback has achieved the best possible 5-Star Overall Crash Test Rating*. You can test-drive the Honda Civic Hatchback EX and the rest of the Civic lineup here at your local Honda dealer, Brilliance Honda of Crystal Lake. We’re located just minutes from Elgin at 680 W. Terra Cotta Ave. in Crystal Lake, IL. 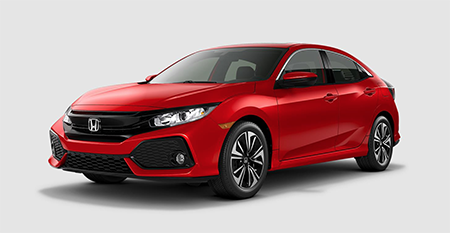 Visit us or contact us online now to learn more about the latest Civic models!